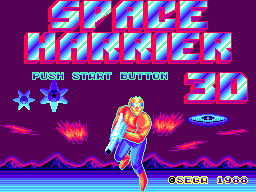 While many praise the port of the original Space Harrier, I do not. All those ugly jaggies around the graphics, choppy speed, washed out colours, etc., I was not impressed. 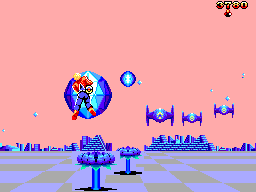 However, Space Harrier 3-D is a different animal. SEGA knew that they needed a name from the arcade to show off the power of the SEGAScope 3D Glasses, and they truly improved on its predecessor. The game concept seems deceptively simple... Just use the D-Pad to move, and Button 1 or Button 2 to shoot... But this game is no walk in the park. You must constantly dodge the onslaught of enemies and their projectiles, ready to shoot you down. The game is unforgiving, and can drive you mad. Fortunately, the novelty, the addictive gameplay, and the drive to beat your high score will keep you coming back. Graphics are a vast improvement over the first game on SMS. The animation, movement, and pseudo-scaling are far smoother on this one. The palettes for enemies and the levels look far nicer, with better shading and colour choice. The enemies seem like they're truly coming at you, out of the screen, only adding to the fast and frantic feeling of this classic. The music is very nice in PSG, with a new tune for nearly every stage and boss fight. 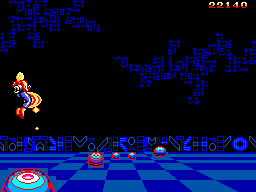 The sound effects are the usual Master System fare though. The game REALLY shines with the FM sound. Listen to that FM remix of the Space Harrier theme. It sounds amazing! Improved from the last. Still just a bit slow, but quite functional. Just use the D-pad to move, and Button 1 or 2 to shoot whatever stands in your way! You'll dig the Harrier's 3-D adventure, with a catchy soundtrack, fast, frantic, unforgiving gameplay, and the drive to get a little further, get a higher score, and beat the game will keep you begging for more punishment from this psyched out and difficult trip of a game. If I were you, I'd pick it up, if you are into rail shooters and arcade games. It's a bit more expensive than the average SMS game, but you'll likely be thankful you got it. There is a cheat, for those who don't want to play it in 3-D, or don't have the glasses, so don't worry about that.